Dissident Russian journalist Arkady Babchenko said on Thursday he collaborated in a plot to fake his own death because he feared being targeted for assassination like former Russian spy Sergei Skripal. Babchenko hit back in a joint interview in Kiev on Thursday, saying that he had gone along with the ruse, organized by Ukrainian security officials, because he feared for his life. 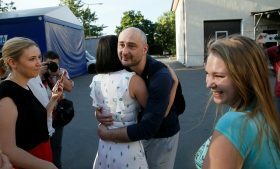 “Everyone who says this undermines trust in journalists: what would you do in my place, if they came to you and said there is a hit out on you?” Babchenko said, saying concerns about his life had to take precedence over worries about journalistic ethics. “But then I realized, where do you hide? Skripal also tried to hide,” he said. His reported murder kindled a war of words between Ukraine and Russia, which have been at loggerheads since a popular revolt in Ukraine in 2014 toppled a Russian-backed government in favor of a pro-Western one. It also produced international condemnation, in part because several prominent Russians critical of Putin have been murdered in recent years, three of them in Ukraine. Opposition groups and human rights organizations say the Kremlin is behind the killings. The Kremlin denies this. He said that a make-up artist had come to his apartment to give him the appearance of a shooting victim, that he was given a T-shirt with bullet holes in it to wear, and that pig’s blood was poured over him. He played dead, he said, while medical teams – who were in on the ruse – took him to hospital in an ambulance and then certified him as dead and sent him to a morgue. 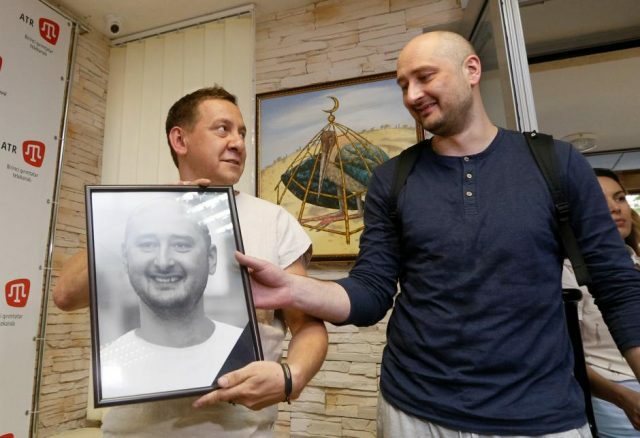 “Once the gates of the morgue closed behind me, I was resurrected,” Babchenko said, saying he had then washed off the fake blood and dressed himself in a sheet. “Then I watched the news and saw what a great guy I had been,” he said, referring to media tributes to him after his death was widely reported. “I got a call from a longtime acquaintance who lives in Moscow, and in the process of communicating with him it turned out that he works for the fund of Comrade Putin precisely to orchestrate destabilization in Ukraine,” he said. The Kremlin, which had called accusations of Russian involvement “the height of cynicism”, said on Thursday it was glad Babchenko was alive, but found the staging of his death strange. Interior Minister Arsen Avakov said he was surprised and shocked by “pseudo-moral” criticism from abroad, while Anton Gerashchenko, a prominent lawmaker and adviser to the minister, said the operation had been vital in order to trace the trail from the would-be assassin to his handlers. They had to believe the plan to kill Babchenko had succeeded “and force them to take a number of actions that will be documented by the investigation,” he wrote on social media. A senior EU diplomat in Kiev said Ukraine’s actions were understandable, but hoped the authorities would provide more information about what had happened.